This king among paint tools, from HYDE, is the only accessory you’ll need to complete your next DIY paint project with ease! Whether you’re refreshing your living room wall color or priming the porch for perfection, when it comes to paint jobs, even DIYers with a can-do spirit can’t do it all on their own. After all, when you find yourself with your hands full, teetering on a ladder to reach that last unpainted square inch, who’s going to secure your paint can or hang onto the narrow paintbrush? The answer isn’t a pricey personal assistant, but instead the HYDE Painter’s Assistant. This multi-tool gives you the second set of hands you’ve always wanted—and the versatility of Picasso himself. Equipped with a magnetized surface, a clippable ladder and belt hook, and paint-removing tines, the Painter’s Assistant easily transforms from a carrying handle for paint containers to an on-demand brush holder and cleaner. Find out how the Painter’s Assistant can help you achieve a perfect—and fumble-proof—finish on your next paint job. While you may be familiar with the paint-can openers, paint-bucket ladder hangers, and paintbrush combs that line the paint aisle of your hardware store, the multipurpose yet lightweight Painter’s Assistant outmatches these single-use tools in both value and versatility. By consolidating all their functions and offering even more conveniences, it provides DIYers of all skill levels with more bang for their buck. Whether you’re painting indoors or out, one room or everywhere in the house, the Painter’s Assistant stands by you from the first brushstroke to the finishing touch. Use the lip on the bottom of the tool to pop open a can of paint like a pro, no screwdriver required. Then, when you’re ready to start painting, flip the tool around. Snapped onto the edge of a one- or two-quart paint container, the Painter’s Assistant acts like a carrying handle, providing a sturdy grip and thereby thwarting paint splatters on the floor or furniture as you move down the wall. If your project has you up a ladder painting a ceiling, wall, or window trim, stay high and dry by hooking the bottom lip of the tool to the paint can’s handle and the other end over a ladder rung—you’ll prevent your paint and yourself from taking a messy spill. The Painter’s Assistant’s can even serve as a belt or garage hook, with its clip and magnetic strip that can keep painter’s tape and other tools of the trade ready for use whenever—and wherever—you are. Should you need to take a breather from the paint fumes or simply want to stop and assess (or admire) your progress, your assistant is ready to hold down the fort. 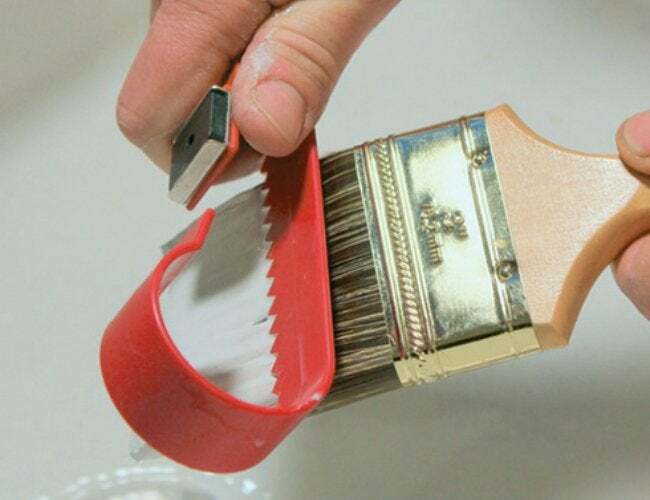 Snap the multi-tool onto the edge of your paint can or tray, and stick your paintbrush onto the tool’s magnetic surface to keep it from falling into the paint. Finally, after completing a successful, no-spill paint job, the Painter’s Assistant instantly morphs into the perfect cleanup companion, thanks to its compact paintbrush cleaner and a paint roller squeegee. 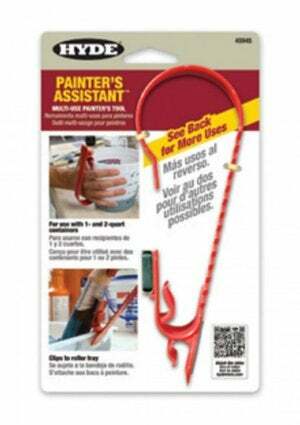 Glide your drenched paint roller through the ring of the Painter’s Assistant to quickly squeeze out excess paint. Or, run the tines of the tool over your paintbrush to clear off the bristles. As you field compliments about your freshly applied, professional-quality paint job, feel free to take all the credit for this team effort—your faithful Painter’s Assistant won’t mind.